Tropicana Las Vegas – A DoubleTree by Hilton brought a casually elegant resort experience to the Las Vegas Strip when it unveiled a $200 million transformation inspired by the style of South Beach. Tropicana’s 1,470 redesigned guest rooms feature a sunset palette of warm shades and custom-designed furnishings, shutters, a sleek chaise or desk, and Serta Perfect Sleeper beds wrapped in 300-thread-count linens. In-room entertainment technology includes 42-inch HDTVs, iHome clock radios, and wireless internet. Meetings convene in more than 100,000 square feet of expanded and remodeled meeting and function space, divisible into as many as 38 breakout rooms, now possible thanks to the Trinidad Meeting Rooms and pillarless, 25,000-square-foot Trinidad Pavilion. Unconventional venues for functions include the Tropicana Theater, the elegant Havana Room, and the Sky Beach Club. Other conference center features include a registration desk, private office, FedEx business center, and Barista Café featuring Starbucks coffee and pastries. Dining options cover a variety of cuisines and atmospheres, including reimagined favorites at Bacio Breakfast; sizzling cuts and fresh seafood at the resort’s top-rated Oakville Steakhouse; indoor or outdoor dining at Savor the Buffet; and a wide range of choices at the South Beach Food Court. Also, don’t miss the recently opened Red Lotus Asian Kitchen and unique dishes at Robert Irvine’s Public House. Additional highlights include first-class entertainment and Glow, a Mandara Spa and fitness center. I was not in the position (at the time) to choose the Tropicana, but I am thrilled we had it! Upon arriving my room was not available (as I did not request early check in), front desk was not able to help; however when I asked to speak with Trisha the Catering & Conference Services Manager; she worked her magic and I was able to begin working in my room within the hour. The entire Catering & Conference Services staff from preplanning to serving was A+. Trish was always available to answer my questions and worked diligently to alleviate any issues or concerns I had. Once the conference began we were surrounded by staff that was polite and always available without being in the way. The food was PERFECT (I am still hearing praises about it) and the AV staff was helpful - even with a last minute change. We had a social event in the front bar and the manager was extremely helpful in arranging for a portion of the space to be ours alone. In addition to amazing services, the cost enabled our non-profit association to stay in the GREEN! 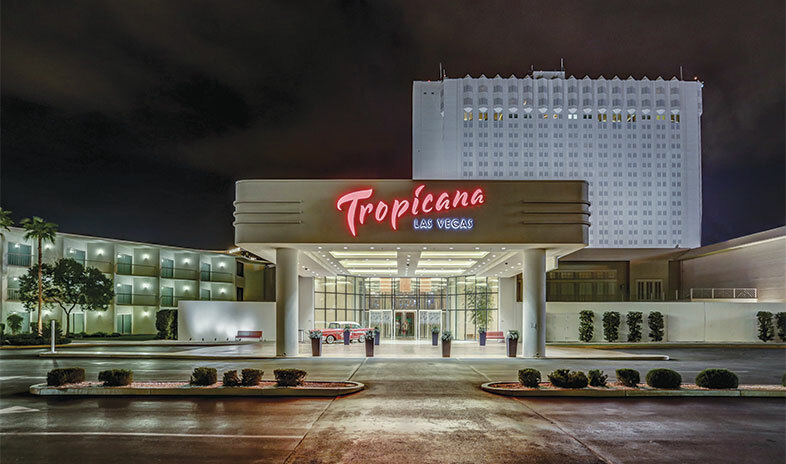 Our annual conference moves from east to west each year, we will be sure the Tropicana is our place to meet when in the west! I almost accidentally came upon the Tropicana Las Vegas as an option for my conference 3 years ago. From my initial contact with the conference coordinator and her team, I was sold. 3 years later, I continue to return to the Tropicana as the place to hold my annual convention. I don't plan on leaving anytime soon! The facilities are first class. The location is awesome. The food for the conference is great! What sets this property apart from other venues is the people at the Tropicana.There may be multiple conferences they have to attend to, but they always make our group feel like we are the only ones in the hotel. It was a long walk to the tower where my room was. I had numerous issues with my key card and not being able to open the door to the room easily. My tub was clogged with hair but I cleaned it out myself. Best pool/area on the strip though! Ticketmaster. For more information about Legends in Concert, visit https://www.legendsinconcert.com. About Tropicana Las Vegas: Set on the famed Four Corners with commanding views of the Las Vegas Strip, Tropicana Las Vegas - a DoubleTree by Hilton is a Penn National Gaming destination and boasts stylish rooms, suites and luxury villas, complete with acclaimed restaurants, premier entertainment options and a 50,000-square-foot casino. The resort redefines the expectations of today's global travelers by providing a casually elegant experience on The Strip, all with a South Beach rhythm and vibe. The property also features Glow® a Mandara Spa and fitness center, Laugh Factory Comedy Club and restaurants such as Bacio Italian Cuisine, Oakville Steakhouse, Robert Irvine's Public House, Red Lotus Asian Kitchen and Savor the Buffet, plus on-the-go options such as Barista Café, Fresh Mix and South Beach Food Court. For more information, visit www.troplv.com. @troplv serving lunch & dinner options www.troplv.com. WHAT:	Red Lotus Asian Kitchen is now open at Tropicana Las Vegas, serving lunch and dinner. Located off the casino floor, guests can enjoy fast, easy and flavorful Asian cuisine with a twist – available for dine-in and grab-and-go, just in time for Chinese New Year, the ‘Year of the Dog’. Led by International chef Steven Leung, guests can indulge in Asian cuisine’s greatest hits with a twist. The menu will feature an array of appetizers, soups, rice and noodle, as well as rice bowl options. Red Lotus Asian Kitchen is open seven days a week, from 11 a.m. to 11 p.m.
MEDIA:	For media inquiries about Red Lotus Asian Kitchen, please reach out to Allied Integrated Marketing at troplv@alliedim.com. @TropLV set to debut in 2017. Restaurant: Impossible, announced today that he is teaming up with Tropicana Las Vegas to open his first signature restaurant on the Las Vegas Strip. At the press conference, the exterior of the Tropicana Las Vegas came to life, where a high-energy video showed the crowd what they can expect to see from the newest chef in town. In true Robert Irvine fashion, the celebrity chef made his entrance by rappelling 22 stories (220 feet) down the exterior of the Tropicana hotel to the assembled press below. Slated to open in 2017, Chef Irvine will bring his nothing-is-impossible attitude to the all-new modern American-inspired restaurant set to debut on Tropicana’s casino floor. With more than 25 years in the culinary profession, Chef Irvine has cooked his way through Europe, the Far East, the Caribbean and the Americas, in hotels and on the high seas. The star chef is known for his experience on the Food Network as host of Restaurant: Impossible and Dinner: Impossible, along with his appearances on All-Star Academy, Chopped: Impossible, Worst Cooks in America, Guy’s Grocery Games and many more. For more information, visit chefirvine.com and www.troplv.com. dedication to the armed services and our country’s heroes. He was first designated Honorary Chief Petty Officer by the U.S. Navy, and later that year awarded the Bob Hope Award for Excellence in Entertainment and Support of our Service Members – a distinguished Patriot Award bestowed upon him by the Congressional Medal of Honor Society. Continuing his support of the military, Irvine will soon become the first celebrity chef to open a restaurant, aptly named Chef Robert Irvine’s Fresh Kitchen, at the Pentagon in the summer of 2016. Also, Irvine just announced the launch of the Robert Irvine Magazine in May 2016. For more information on Chef Robert Irvine, visit www.ChefIrvine.com. Tropicana Las Vegas - a DoubleTree by Hilton is a Penn National Gaming resort located on the south end of the Las Vegas Strip just minutes from the airport, major convention centers and top entertainment stadiums. With a unique South Beach vibe after a $200 million complete transformation, the hotel features renovated rooms, suites and luxury villas, a fresh redesign of the 50,000-square-foot casino, several award-winning restaurants, a state-of-the-art race and sports book, and Glow®, a Mandara Spa and fitness center. First-class entertainment includes “Raiding the Rock Vault” in the Tropicana Theater, the world-famous Laugh Factory comedy club and live music in the Tropicana Lounge. For more information, visit www.troplv.com. Penn National Gaming owns, operates or has ownership interests in gaming and racing facilities and video gaming terminal operations with a focus on slot machine entertainment. At March 31, 2016, the Company operated twenty-seven facilities in seventeen jurisdictions, including Florida, Illinois, Indiana, Kansas, Maine, Massachusetts, Maryland, Mississippi, Missouri, Nevada, New Jersey, New Mexico, Ohio, Pennsylvania, Texas, West Virginia, and Ontario. At March 31, 2016, in aggregate, Penn National Gaming operated approximately 33,400 gaming machines, 800 table games and 4,600 hotel rooms. LAS VEGAS – May 13, 2016 – Due to overwhelming response, legendary comedian and impersonator Rich Little has announced his hilarious one-man show Rich Little Live! has been extended through January 2017 at the world-famous Laugh Factory inside Tropicana Las Vegas. Featuring a compilation of impersonations, sketches and interactive video, Rich Little Live! highlights the actors, musicians, politicians and personalities Little has worked with throughout his more than 50 years in entertainment, spanning from his television career in Canada to his first United States appearances to the legendary “Dean Martin Roasts” to the present day. “I’m elated to once again extend my one-man show Rich Little Live! at Tropicana Las Vegas,” said Rich Little. “My career has been quite the journey that has taken me around the world and given me the opportunity to work with Presidents, musicians and some of Hollywood’s most legendary stars. It’s been such a thrill for me to re-live some of my favorite stories from the past 50 years and I look forward to continued success on the Las Vegas Strip.” “When it comes to Las Vegas entertainment, Rich Little is king,” said Jamie Masada, Laugh Factory CEO. “We are proud to announce that the world-famous Laugh Factory will be extending Rich Little’s engagement for another year! His brilliant impressions and comedy have entertained millions of people and inspired so many of our young comedians today.” Tropicana Las Vegas’ Vice President of Daylife & Nightlife, Howard Weiss, states, “We are thrilled to have Rich Little part of the Tropicana Las Vegas family and we are excited about the continued partnership and extended engagement as I know our guests will too.” Rich Little Live! is performed Saturday-Sunday and Tuesday-Thursday (dark Mondays and Fridays) inside the renowned Laugh Factory, located on the mezzanine level of the Paradise Tower inside Tropicana Las Vegas. All shows begin at 7 p.m. Tickets are $39.95 for General Admission, $49.95 for a VIP Table and $59.95 for Golden Circle and VIP booths (plus applicable taxes and service fees), and can be purchased in-person at the Tropicana Las Vegas Show Tickets desk, online at www.troplv.com or by phone at 800-829-9034. Rich Little Live! is an all-ages show. Muppet Show. Named “Comedy Star of the Year” by the American Guild of Variety Artists, Little was the perpetrator of nine comedy albums and three HBO comedy specials, as well as the Emmy award-winning special Rich Little’s Christmas Carol. A master mimic of more than 200 voices, Little continues to impress with a touring schedule throughout the United States and Canada and is currently performing inside the Laugh Factory at New Tropicana Las Vegas, for an extended engagement of his show “Rich Little Live” and is also touring with his latest project, “Little by Little” a self-written, humorous show about his life, featuring more than 30 characters. A book of the same title (…People I’ve Known and Been) is due to be released in summer 2016.
their religion, ethnicity or country. Consequently, its mission is to spread laughter throughout the world through its clubs and website and spread the concept of sharing and giving back through its philanthropic activities. With locations in Hollywood, Long Beach, Las Vegas, Chicago, Scottsdale, Reno and soon to open in San Diego, The Laugh Factory is known around the world as one of the premiere spots for comedy. Tropicana Las Vegas is a Penn National Gaming resort located on the south end of the Las Vegas Strip just minutes from the airport, major convention centers and top entertainment stadiums. With a unique South Beach vibe after a $200 million complete transformation, the hotel features renovated rooms, suites and luxury villas, a fresh redesign of the 50,000-square-foot casino, several award-winning restaurants, a state-of the-art race and sports book, and Glow®, a Mandara Spa and fitness center. First-class entertainment includes “Raiding the Rock Vault” in the Tropicana Theater, the world-famous Laugh Factory comedy club and live music in the Tropicana Lounge. LAS VEGAS (Jan. 27, 2015) – The New Tropicana Las Vegas - a DoubleTree by Hilton today announced the deployment of new Wi-Fi technology, including wired and wireless Internet access beginning March 2015. The Internet access will be available throughout the property’s approximate 100,000 square feet of convention space, including the new Trinidad Pavilion, slated for completion in March 2015, as well as in the resort’s 1,467 guest rooms and suites. Once complete, the resort will provide one of the fastest Internet services available in a Las Vegas hotel. For information on Tropicana Las Vegas meetings, visit Troplv.com/Las-Vegas/Meetings-Conventions. With the rollout of the significantly upgraded infrastructure, meeting organizers and attendees will enjoy increased mobility and a substantial leap in bandwidth availability in the conference center and hotel rooms. This allows for streaming of high-definition video without jitter or latency, downloading large business presentations, using cloud applications and sending/receiving large files or photos and other digital data without delay. The New Tropicana Las Vegas - a DoubleTree by Hilton hosts a wide variety of functions such as conventions, corporate meetings, spectacular wedding receptions and more in its existing 72,000 square feet of meeting and exhibition space. Once the expansion is complete, the Trinidad Pavilion as a whole will provide 55,000 square feet of meeting space that will be able to accommodate large groups that can be entirely self-contained in the space. Meeting planners can also earn Hilton HHonors Event Planner Points for qualifying new bookings in the resort’s conference facilities. To plan an event at The New Tropicana Las Vegas - a DoubleTree by Hilton, please call 888.810.8767 or visit TropLV.com. Prepare to be surprised. The New Tropicana Las Vegas - a DoubleTree by Hilton redefines the expectations of today’s global travelers with a recently completed $200 million transformation that provides a casually elegant experience on the Las Vegas Strip. With a unique South Beach vibe, the resort features all-new rooms, suites and luxury villas that evoke the sentiment of a breezy beach house or penthouse in Miami, a fresh redesign of the 50,000-square-foot casino, several award-winning restaurants, a new race and sports book, and Glow®, a Mandara Spa and fitness center. First-class entertainment includes “The New Illusions” starring Jan Rouven and “Raiding the Rock Vault” in the all-new Tropicana Theater, Laugh Factory comedy club and live music in the Tropicana Lounge. LAS VEGAS (August 26, 2014) – Tropicana Las Vegas - a DoubleTree by Hilton today announced a March 1, 2015, completion date for construction to expand the Tropicana Pavilion and increase the resort’s total meeting and convention facilities to 100,000 square feet. The expansion, which also includes enhancements to the existing pavilion area, will make the resort a leading property for convention business in Las Vegas. The new 26,000-square-foot Tropicana Pavilion area will offer up to 11 separate breakout rooms, some with up to 16-foot ceilings, and will feature new private restrooms as well as new escalators. The current Tropicana Pavilion will also be enhanced, including a decorative acoustic treatment for the walls. Once the addition is complete, the Tropicana Pavilion as a whole will provide 55,000 square feet of meeting space that will be able to accommodate larger groups that can be entirely self-contained in the space. Tropicana Las Vegas - a DoubleTree by Hilton currently hosts a wide variety of functions such as conventions, corporate meetings, spectacular wedding receptions and more. Hilton HHonors meeting planners can also earn Hilton HHonors Event Planner Points for qualifying new bookings in the resort’s conference facilities. To plan an event at Tropicana Las Vegas - a DoubleTree by Hilton, please call 888.810.8767 or visit TropLV.com. Prepare to be surprised. Tropicana Las Vegas - a DoubleTree by Hilton redefines the expectations of today’s global travelers with a recently completed $200 million transformation that provides a casually elegant experience on the Las Vegas Strip. With a unique South Beach vibe, the resort features all-new rooms, suites and luxury villas that evoke the sentiment of a breezy beach house or penthouse in Miami, a fresh redesign of the 50,000-square-foot casino, several award-winning restaurants, a new race and sports book, and Glow®, a Mandara Spa and fitness center. First-class entertainment includes headliners in the all-new Tropicana Theater, Laugh Factory comedy club and live music in the Tropicana Lounge. LAS VEGAS (January 28, 2014) — The New Tropicana resort in Las Vegas unveils the Sky Villa Suites, which offer an entirely new level of luxury accommodations for guests. Located on the 20th floor of the Paradise tower, the suites offer breathtaking views of the Las Vegas Strip with floor-to-ceiling windows in an elegant and glamorous atmosphere. The Sky Villa Suites are a key part of the resort’s approximate $200 million transformation that has touched every corner of the property including all 1,467 guestrooms, the casino floor and restaurants, and the Tropicana Theater. Designed by Alex Yemenidjian and Annie Gevorkian, the Sky Villa Suites were created with an emphasis on modern glamour. These Las Vegas luxury suites include custom furnishings with white lacquered panels and Honey Birdseye and Anigre Lacewood highlighted with gold leaf. To give the suite added beauty and warmth, custom Golden Spider Natural Marble and luxurious carpet is used throughout. Cove lighting creates a soothing ambiance throughout the room. To accentuate the space with bold colors, specially designed abstract artwork is exhibited in the rooms. These Las Vegas suites feature an unparalleled master bedroom and bathroom with his-and-her walk-in closets and a stunning gold leaf headboard. The master bathroom has two walk-in steam showers with LED showerheads, private water closets, LED backlit mirrors, and a spacious whirlpool spa for two. The lavish whirlpool tub is wrapped in marble mosaic with a massage function, air jets with LED lights, a computer control panel, a TV and Kohler water filler from the ceiling. Each of these penthouse apartment-style suites also includes a wet bar, private spa/massage room and office. The New Tropicana Las Vegas also offers eight other suite types throughout the resort including the two-story Penthouse Loft suites, the chic Presidential Suite and Chairman Suite, and the Pool Villa Suites. Like the Sky Villa Suites, the six Pool Villa Suites that have recently been made available to the public offer elite travelers exceptional accommodations. With a strong emphasis on privacy and an atmosphere conducive to relaxing and socializing, the 760-square-foot suites blend pure natural elements with clean modern shapes. Comfortable, custom-built furniture incorporates the beauty and warmth of Anigre Lacewood while marble mosaic walls give the rooms a natural sheen, and sandstone tile accented by hand-knotted banana-wool area rugs combine to create a bright yet cozy atmosphere. Each Pool Villa is a luxuriously appointed Las Vegas suite featuring a spacious bedroom and a large living room with a marble-top wet bar and sub-zero refrigerator. Other features include a private balcony with a 44-jet whirlpool spa, DynaStar LED lighting and cascading waterfall, and dining and lounge areas overlooking a private lawn and the Tropicana pool. The Pool Villa Suites also offer the Creston Control Systems and colorful custom artwork. All of the suites in this Las Vegas resort on the Strip are available for booking. For Tropicana Las Vegas hotel reservations or for additional information, please visit www.TropLV.com or call 1-800-GO2-TROP. Prepare to be surprised! The New Tropicana resort in Las Vegas redefines the expectations of today’s global travelers with a recently completed $200 million transformation that provides a casually elegant resort experience. In addition to a South Beach rhythm and vibe, the transformation of the resort includes a fresh redesign of every best-in-class room and suite, the 50,000-square-foot casino, more than 100,000 square feet of meeting and exhibition space, several new restaurants and bars, a new race and sports book, and Glow®, a Mandara Spa and fitness center. First-class entertainment includes headliners in the all-new Tropicana Theater, Laugh Factory and live music in the Tropicana Lounge. Coming spring 2014, the Tropicana Theater will be home to the smash hit musical MAMMA MIA! For a virtual tour, visit www1.TropLV.com/Video. Havana Room - Las Vegas' Most Unique Event Locale. The Havana Room’s lavishly designed space provides an ambiance that is simply irresistible. Adorned with a magnificent crystal chandelier as the focal design element and surrounded by more than 40 custom-built banquette-seating areas, this Las Vegas event space also includes three full-service bars, a dark wood dance floor and premium audio-visual technology. Beach Club - Host Your Perfect Poolside Event. The Beach Club is the ideal location for outdoor events. Its two breathtaking pools are encased by fountains, palm trees, and luxurious cabanas and daybeds. Other highlights include a 33-by-9-foot LED screen perfect for promotions, branding and entertainment, a full-service bar, state-of-the art technology, and an exclusive location set apart from the Tropicana pool area. These amazing venues are now available for group functions, so don't let this opportunity pass you by. Send us a note at sales@troplv.com or call us at 888.810.8767 for more information or for a tour of these unique spaces. LAS VEGAS (Sept. 17, 2013) – The New Tropicana Las Vegas announced today the addition of two distinctive Las Vegas event venues – the Havana Room and Beach Club. Already an exquisite setting for hosting unforgettable occasions, the resort’s new venues will be the perfect backdrop for Las Vegas weddings, special events, elaborate dinners and corporate holiday parties. Visit http://trop.lv/1amDLMw to view photos of the Havana Room and Beach Club. The Beach Club is the ideal location for outdoor events. Its two breathtaking pools are encased by fountains, palm trees, and luxurious cabanas and daybeds. Other highlights include two Olympic-size sand volleyball courts, a full-service bar, state-of-the art technology, and an exclusive location set apart from the Tropicana pool area. For more information or to host an event in the Havana Room or Beach Club, please visit TropLV.com or call 888.810.8767. Prepare to be surprised! The New Tropicana Las Vegas redefines the expectations of today’s global travelers with a recently completed $200 million transformation that provides a casually elegant resort experience. In addition to a South Beach rhythm and vibe, the transformation of the resort includes a fresh redesign of every best-in-class room and suite, the 50,000-square-foot casino, more than 100,000 square feet of meeting and exhibition space, several new restaurants and bars, a new race and sports book, and Glow®, a Mandara Spa and fitness center. First-class entertainment includes headliners in the all-new Tropicana Theater, Laugh Factory and live music in the Tropicana Lounge. For a virtual tour, visit http://www1.troplv.com/video. LAS VEGAS (June 4, 2013) – The new Tropicana Las Vegas - a DoubleTree by Hilton today announced plans to significantly expand its meeting and convention facilities to more than 100,000 square feet. Already offering more than 60,000 square feet of meeting and exhibition space, the conference center at Tropicana Las Vegas has become the ideal venue for meeting planners due to its flexible options and ability to host events of nearly any size, from intimate gatherings to large events for up to 3,000 guests. The hotel will begin its expansion by constructing five 650-square-foot breakout rooms on the second floor of the Club Tower, adding to its three ballrooms, which comprise 19 breakout rooms in the conference center. All of the new breakout rooms will have private his-and-her restrooms and the warmth of natural light. As part of the transformation, the resort will expand the Tropicana Pavilion, which is a wing of Tropicana Las Vegas’ conference center. When combined with existing space in the Tropicana Pavilion, the venue will offer more than 55,000 square feet that can be used for large exhibits and general sessions with utmost flexibility. All of the meeting facilities at the resort are complemented by customizable catering services, a dedicated A/V department, separate conference services registration desk, business center and easy parking access, among other benefits. For more information or to plan an event at Tropicana Las Vegas, please call (888) 810-8767 or visit TropLV.com. Prepare to be surprised! The New Tropicana Las Vegas redefines the expectations of today’s global travelers with a recently completed $200 million transformation that provides a casually elegant resort experience. In addition to a South Beach rhythm and vibe, the transformation of the resort includes a fresh redesign of every best-in-class room and suite, the 50,000-square-foot casino, more than 100,000 square feet of meeting and exhibition space, several new restaurants and bars, a new race and sports book, Glow®, a Mandara Spa and fitness center, and Bagatelle Beach. First-class entertainment includes headliners in the all-new Tropicana Theater, Laugh Factory, the Mob Attraction Las Vegas and live music in the Tropicana Lounge. LAS VEGAS (February 21, 2013) – In the wake of a two-and-a-half-month transformation, the Tropicana Theater reopened this past Valentine’s Weekend unveiling a state-of-the-art venue. To celebrate the groundbreaking event, popular pop/rock band Chicago welcomed the first patrons to the new venue designed to create an intimate connection between audiences and the talents on its storied stage. The transformation began in early December, with the goal of bringing an entirely new look and feel to the theater. The result is a modern yet classic design incorporating vibrant colors with all-new furniture and other materials to provide an engaging, comfortable environment. A tiered, bowl-shaped design ensures that every seat in the house has a clear view of the stage, with a floor plan encompassing 1,045 seats. To further differentiate the theater and provide a special experience to VIP customers, the front rows are comprised of nearly two dozen U-shaped booths and a dozen four-seat cocktail tables, a nostalgic throwback to classic Vegas cabaret-style seating with a very modern twist. Having recently hosted Dancing with the Stars: Live in Las Vegas, and seeking to accommodate other shows with often elaborate lighting requirements, the theater now features all-new lighting equipment which includes a GrandMA2 console and rotating, color-mixable Vari*Lite VL2500 wash and spot lights. With discriminating touring acts and audiences in mind, the new Tropicana Theater has also been designed to offer a superb acoustic environment where guests in every seat can hear every detail. The consistent, well-equalized sound is anchored by a Yamaha M7Cl-48 sound console and d&b speaker system. Well-positioned for the future, the Tropicana Theater remains rich with Las Vegas history. The space opened in 1973 as the Superstar Theatre and hosted such talents as Sammy Davis, Jr., Mitzi Gaynor, Jack Benny, Phyllis Diller, Lou Rawls, Ann-Margret, Pearl Bailey, Vikki Carr and The Osmonds. In 1975 it was rechristened the Tiffany Theatre as the new home for the hotel’s long-running Folies Bergere, subsequently welcoming diverse performers from Wayne Newton, Gladys Knight, Beck and Tenacious D to Rick Thomas and his white Bengal tigers and Dancing with the Stars. Prepare to be surprised! The New Tropicana Las Vegas redefines the expectations of today’s global travelers with a recently completed $200 million transformation that provides a casually elegant resort experience. In addition to a South Beach rhythm and vibe, the transformation of the resort includes a fresh redesign of every best-in-class room and suite, the 50,000-square-foot casino, more than 60,000 square feet of meeting and exhibition space, several new restaurants and bars, a new race and sports book, Glow®, a Mandara Spa and fitness center, and Bagatelle Supper Club & Beach Club. First-class entertainment includes Dancing with the Stars: Live in Las Vegas (seasonal), Laugh Factory and the Mob Attraction Las Vegas.